This is a handy trick either within an email or a long web page. You can place a link to a section of the page such as chapters or sections. Open up your editor, the first step you will need to do is add an Anchor at the destination location of the link. This is like a bookmark within the page that you will refer to when creating a link. Anchor Name: specifies the anchor name. You will be referring to this name while linking to the anchor. Press “OK” and the anchor will appear in your document. You won’t see the anchor but it will be placed in the code of the page as a reference. 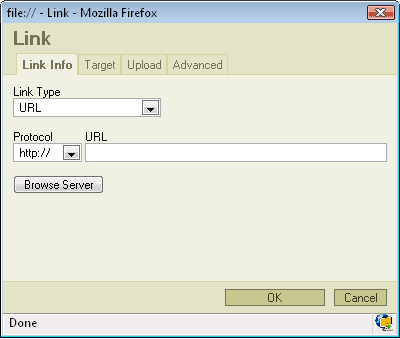 To insert a link to an URL address, anchor or an e.mail press button on the toolbar. A popup window called “Link” will appear. 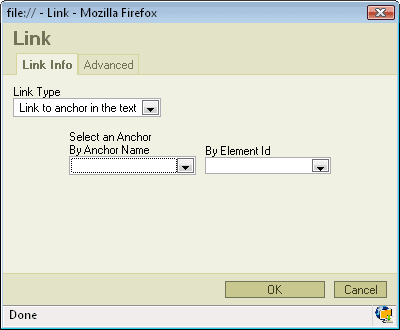 Link Type: specifies the type of link you want to put in the document. You can choose from “URL”, “Link to anchor in the text” or “E-mail”. Depending on which option you will choose different options and bookmarks will appear in the window. We will start from the Link Type: URL. If you chose Link Type: Link to anchor in the text new options will appear in the Link Info bookmark. You may select the link to the anchor in two ways. By Anchor Name: selects the anchor by name you have previously specified in anchor properties. By Element Id: selects the anchor by Id. Pressing “OK” will insert the link in your document. For email you can send a test to yourself or preview your web page to test out the link. Using these anchors should make your document easier to read.